In providing a prequel for the galaxy’s favorite smuggler, Solo: A Star Wars Story essentially served as a series of mini-origin stories for all the little details of Han’s previous screen outings, from the character’s Kessel Run brag in A New Hope, to that gap at the front of the Millennium Falcon. Some of these of explanations were more welcome than others, but if there’s one backstory that just about every viewer can agree was unnecessary, it’s the justification for Han’s last name. Come to think of it, if “Solo” is a widely understood label in the Imperial forces, then it stands to reason that there are various other Solos serving in the Navy at the same time, each of them deemed a scrumrat by the Empire. Perhaps that’s a line of thought for another time, but for now, you can decide for yourself whether this development manages to redeem one of the most awkward moments in the movie, or just draws further, unneeded attention to it. 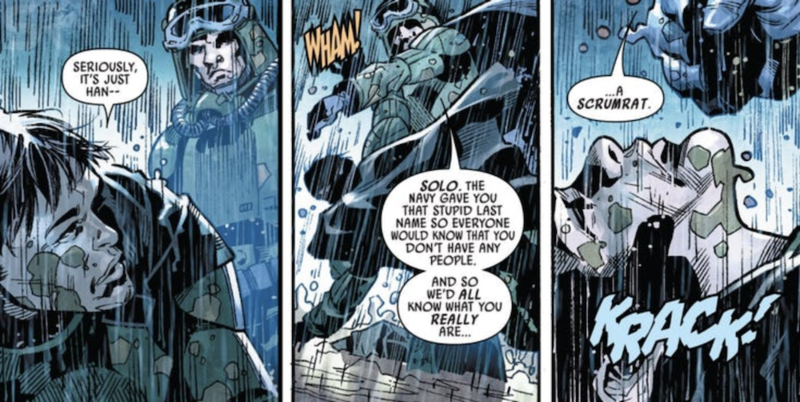 In any case, this is just one of numerous instances of Solo’s tie-in releases filling in the blanks, with another recent example from the comics being an explanation for how exactly Han got kicked out of the academy. And if the film left you intrigued to learn more about its characters, then these non-cinematic sources might be your best options, since the chances are looking pretty slim of Solo: A Star Wars Story ever landing a sequel.